Newspapers may be dying, but there still sure are a lot of them out there—not just in the United States, but around the world. David Earnest’s Newspapers and World Newspapers for the iPhone and iPod touch offer readers a convenient—if unadorned—gateway to hundreds of publications in the U.S. and across the globe. But who would really use these applications? After all, there are plenty of first-rate RSS readers out there. And several national and international media outlets—including the New York Times, USA Today, and the Wall Street Journal—offer free apps for their readers. My guess is both apps would to appeal to travelers who want easy access to local news as they come and go. Truth is, Newspapers and World Newspapers are newspaper applications for the lazy. What Earnest has done is collect links to hundreds of U.S. and world newspapers and group them by state, country, and world region. Newspapers includes only U.S.-based papers, while World Newspapers incorporates the content of Newspapers as well as links to papers in Africa, the Americas, Asia, Europe, and the Middle East. Around the World: ... while World Newspapers takes the same no-frills approach on a global basis. And that’s all. Newspapers and World Newspapers are no-frills Web link aggregators. You scroll through lists looking for a newspaper, you tap the name, and the app will launch the paper’s Web site in a browser within the app. You can e-mail links from both applications and open links in Safari, and the apps will show your recently viewed papers, but that’s really the extent of what Newspapers and World Newspapers do. Both require a Wi-Fi or 3G/EDGE connection to work. The newspaper list is long but surprisingly not exhaustive, and I’m not certain why some papers are present while others are missing. The Rocky Mountain News, which closed down in February, still appears under Denver, Colorado’s newspapers. Yet, in my smoggy end of Southern California, Newspapers offers no link to either the Press-Enterprise in Riverside, which is the largest Inland Empire news source, or to the San Bernardino Sun. Strange. 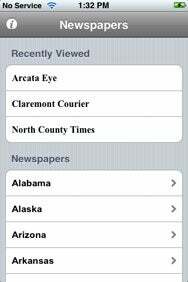 However, I was pleased to find Arcata Eye listed. Nobody does a police blotter like that scrappy Northern California weekly. To say “that’s all” Newspapers and World Newspapers do is not necessarily the same as saying “that’s nothing.” You could, of course, simply bookmark all of these papers and save a buck. But who has that kind of time? And for the stranger in a somewhat strange land, having access to information he may not have known was available to him—for example, World Newspapers features nearly 60 newspapers in India, including seven English-language dailies in New Delhi alone—is a useful and valuable resource to have in the palm of one’s hand. So, in certain respects, Newspapers and World Newspapers do readers a service by collecting what amounts to hundreds of bookmarks and putting them in a more-or-less easy to navigate application. I would note, however, that iNewz ( ) performs a similar service allowing readers to explore multiple foreign sources using RSS feeds. iNewz is similarly bare-bones, easy to maintain, with a great selection of news sources but mediocre offline support. If you prefer to browse headlines from foreign and domestic sources rather than navigating several Web sites on the iPhone’s small screen, iNewz might be the better way to go. Newspapers and World Newspapers are compatible with any iPhone or iPod touch running the iPhone 2.x software update.